The exclusive interview of Lucas Fox first drummer and co-founder of Motörhead, with the agreement of the record label Cléopatra. 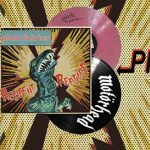 He introduces : Before world premiere listening to 3 tracks from the album « Resident Reptile » by Pink Fairies (Released in the month of April/May 2018). and The release of the 1975 book dedicated to On Parole the 1st Album of Motörhead in US edition. Plug in Les Rencontres d’Averroès Juniors & Biénale des Jeunes Créateurs de Europe et de la Méditerranée à ANCÔNE [ITALIE].